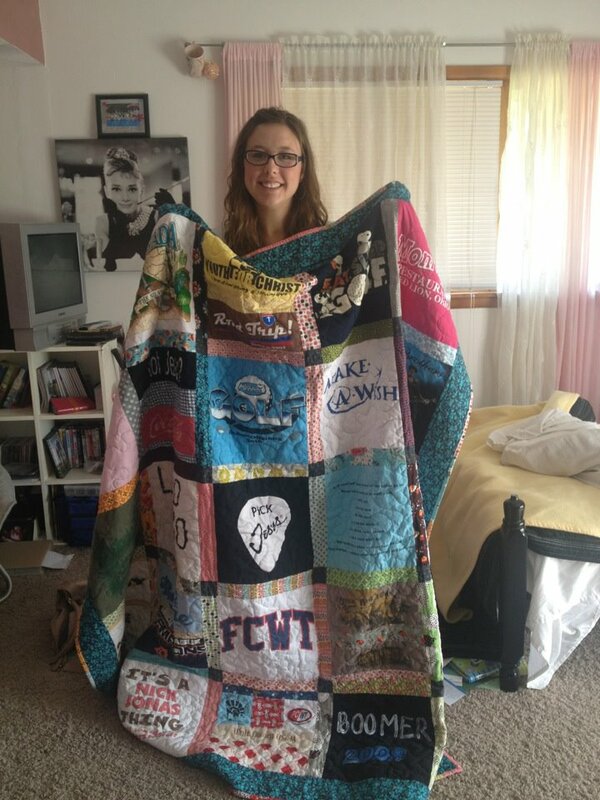 This is my daughter's best buddy, Hannah, with the t-shirt quilt I made her for graduation. So many of you have inquired about the custom t-shirt quilts that I make that I want to provide you with some information if you want to make your own. The book that I use is out of print but I ordered one from the Shabby Fabrics website that looks fabulous. The key is to back the t-shirts with a very light weight fusible interfacing so that they don't stretch when you cut them. Interfacing allows you to use a very well worn and loved t-shirt as well because it gives the extra strength. The quilt normally has 20-25 12" squares but I used around 35 t-shirts for my son's quilt by cutting and piecing more than one shirt per block. The possibilities are endless. I have been asked other sewing questions recently and would like to do a question and answer post. If you have a question for me, any type of question (sewing or otherwise), leave me a comment today and I will answer all questions in one post next week. Happy Friday! The quilt shop close to my cottage, is having a class about making this kind of quilts in September...looking forward to it. i love the title of your post and how it fits the memory quilt. I will be checking out how to make it. I have offered to make a smaller quilt for my friend and neighbor whose 3 year old son was killed in an accident in January. We are selecting some of his shirts and blankets to sew into a memory quilt. Do you use a specific interfacing? I do enjoy making t-shirt quilts but haven't had to do more than 1 at a time! They could get a bit tedious and they are definitely on the heavier side! Much better than a scrap book!!! You do such a fantastic job with those T-shirt quilts. I have seen lots and done one, but yours is the best yet. Love your Granny squares too. I want to find time to work a few of those in. A great use of small scraps. This is a fantastic quilt. Thanks so much for sharing how you do these. My granddaughters are 16 now, so I see a couple of these in my future.